This is the 14th year of the student paper competition which was initiated at the 2001 IEEE International Ultrasonics Symposium in Atlanta, Georgia, USA. The award consists of a certificate, and represents a prestigious recognition of the student's achievement. Students who are submitting abstracts for presentation are also invited to participate in this Student Paper Competition (see "Requirements" below for conditions). Furthermore, students are highly encouraged to become a student member of the IEEE and UFFC professional societies. Abstracts submitted by students for the Student Paper Competition will be reviewed as usual by the Technical Program Committee (TPC). At that time the TPC will select 18 finalists (6 from Group I, and 3 from each of Groups II to V) for the Student Paper Competition (roughly in proportion to the number of student abstracts submitted in each group). The finalists will be notified and asked to produce a poster of their papers to be displayed during a special student poster session. At the time of the poster presentation, the finalist is required to be a registered member of IEEE and UFFC. The poster is required independent of whether the student's paper has been selected as an oral presentation. The students should check the guidelines for poster presentation for the preparations of their posters. All Student Finalist Posters will be presented in a special section for judging by a panel of judges representing the paper's technical group. The posters will remain on display for the duration of the symposium. Six awards will be given and the winners will be honored during the banquet. 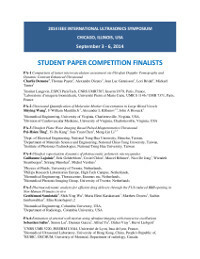 The finalists for the 2014 Student Paper Competition have been selected.